So, every once in awhile, it ends up “My Turn” to cook something. Usually as a result of my own volition, maybe the desire to try something new or something I particularly LIKE, or when your esteemed COOKING EXPERT @RealMagdaCooks is not in the mood or tired for example. I tend to stick to what I know works, as Magda is very picky, and hard to please. And she is always blaming me for this particular trait. Try her. Can’t eat a tortilla to save her life. Don’t like gravy’s. Nor peas. And others. Anyway, this is NOT about her, this is about the meal. When I was single, and on the road, frequently, I really didn’t eat much in the way of home cooked meals, like we are all guilty of on occasion. I really did not learn how to cook from my Mom, either, it was more I had to learn to cook to just EAT… eating out frequently is expensive, (I am a KUTWA after all, look it up…) and its rather unhealthy. Lately even being ungodly busy, as we are, Magda has a rule, that “we should eat” one meal together everyday. Its some family gimmick she pushes on me. I go along with it, cause, guys listen to me, a happy woman, equals a peaceful day. Remember that, next time you’re stuck with your hand as your primary source of enlightenment. OK, on to the good stuff. I tend to like to make “white sauces” and “pasta style” dishes, along with Ethnic foods like Asian, and Mexican fairly decent. I am not tooting my own horn here, just stating the facts. And in that vein, let me introduce you to my variation on a simple yet tasty dish. 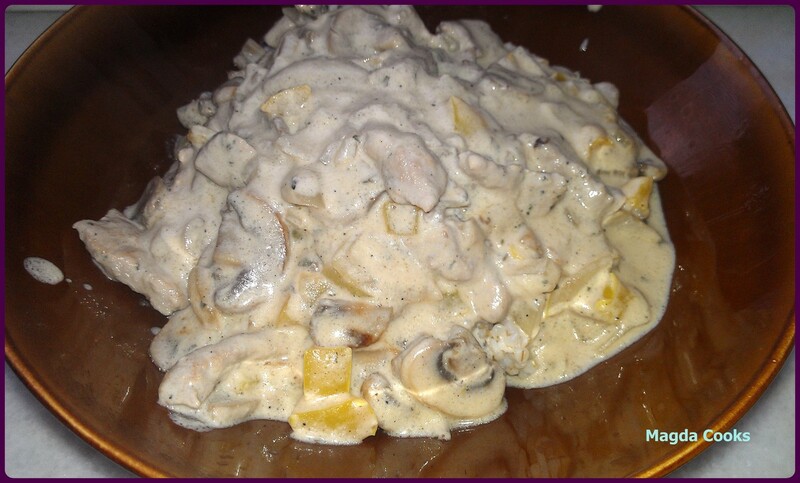 That is Mushrooms with Pork, in a Sour Cream based sauce with Barley. I <3’s me some barley, much like oatmeal, and other grains. This meal produced 2 rather heaping bowls of the meal, along with some leftovers. I’d say it could rather easily feed 3… with an additional boil in the bag of barley. Clean the Mushrooms if there is some soil on them. Cut them into small chunks, or slices (either works, just slices cook faster) while cutting them, heat up your pan on a not too high flame, or wok (I used a wok for this dish), add some Olive Oil, and toss them onto the pan, LIGHTLY salt (they will release water if you overdo it! ), a little pepper, and a little of margarine, along with 1 of the bouillon cubes. While they are sauteing, and browning up, start to prepare your Pork. Take whatever style of Pork you got, and cut it into small strips, clearly the precise size is like the size of your pinky, and then cut it in half LENGTHWISE. Thus creating 2 pieces. While you are doing this, occasionally check on your Shrooms’ toss them a few times, to circulate the seasoning and to cook them throughout. While you wait for them, spread your Pork out evenly onto whatever your surface is, and use the Yellow Poison, Thyme, Salt and Pepper to your likes, and tastes, and toss it about… not the kitchen but just the small surface you’re using. And if you want or feel like it, add some other green spices, or something along those lines. OK, so the Shrooms’ are done, when they’re browned, again too your likes, and needs, and there should be a little “fluid” left behind. Take them out, and place them into a bowl nearby. Then pour into the pan a tiny more of the Olive Oil, and the MILK… then toss your seasoned, and cut Pork into the pan. Toss in the remaining bouillon cube too, and since you’re using the cubes, be careful to not over salt the pork or shrooms. Still on medium heat. While this gets to a boil, clean and cut the Pepper and Onion. The pepper into small chunks, slice and dice the onion, like it owes you money! While this is underway, heat up a pot of water ⅔ full and boil it. Add the bags of barley into it, and cook it to the specifications of the manufacturers recommendations for the density. You could also use various types of Rice with this meal, Brown, Multi Grain, Basmati, or even the brutally high in carbs but cheap, white rice. Or even mashed potatoes if you so desire. Then after about 10 minutes of the pork cooking you’re ready to toss the Vegs in, just NOT the shrooms’ yet. Give this about another 10 minutes, to cook down and mix the flavors together, along with any water or whatever. Add the Sour Cream, stir it good, if it seems a bit thick, you can add a little water to the sour cream cup or whatever its packaged in and use it to liquify it a bit. A little is the key word here, like max 100 ml of water. Then, stir again, toss in the mushrooms. Lets this mix up, and share the flavors. At this point, the barley or rice, heck, even PASTA would work, should be ready to go. Drain it, toss the barley (or other into a bowl) and then spoon heaping mounds of the prepared pork and mushroom mixture onto the barley, etc. Reversal of Destiny: Magdas Thoughts and Rating. “actually it’s one of my favorites 😉 mostly because I didn’t have to do it 😛 joking – it’s really good, creamy and rich. And in closing, please use the DISCUS system to leave some feedback. We get none of your personal information. Any type of that is used FOR the tracking of your comments, via your Facebook account or whatever. Linking it will not cause you any harm or spam. Only Discus will email you if you ask for follow ups or to follow the post, etc. Its really harmless. Additionally, leaving comments gives us the ability to know what you LIKE and DO NOT LIKE, if you tried it, and maybe altered it a little or LOT and other stuff along those lines. Please I encourage you. And it is NOT limited to just English speaking people, everyone can jump in, this is not limited. Its unlimited like the sky is… give it a shot, you will not regret it. Thanks for reading.